There are many AROS distributions, but the easiest packages to install is a AROS package called Icaros Desktop. You can check Icaros Desktop website, and download it from their website here. Download the desired AROS – Icaros Desktop package. Latest version is v2.1.3 and can be Download from them directly here! On Windows you can just start the file called “Run_Icaros_in_Windows.bat“, but for getting the best experience follow this guide further and dont use Qemu! Showing of VirtualBox website in OWB 1.25 on AROS! 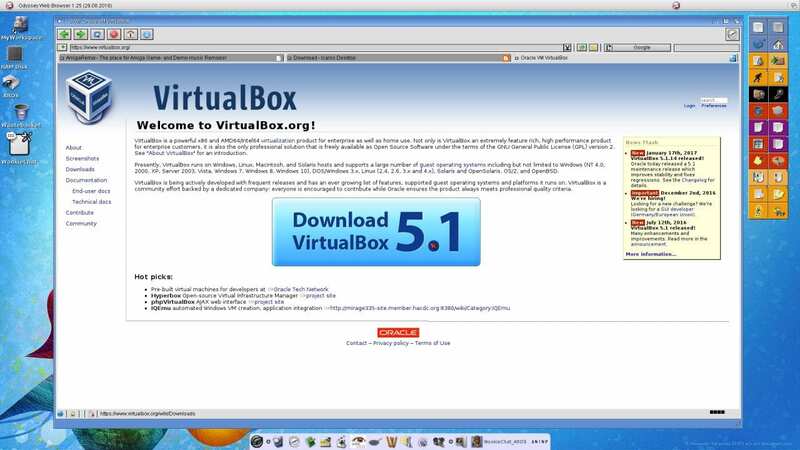 Remember to use a browser for Windows, MacOSX, Linux or Solaris so you can download VirtualBox there. I have tested many Virtual Machine clients out there. The one that comes with AROS – Icaros Desktop package, is very slow and I would NOT recommend to use Qemu it at all. Its nice to test things, but for installing I wouldn’t recommend it at all. Vmware is another solution, that costs. However, I tried their 30 days trial and for me it didn’t do what I wanted it to do. Running AROS in fullscreen gave me issues and I never managed getting my native 1920×1080 fullscreen experience. In the end, I got help on #AROS (a Freenode IRC channel) and got the tip about VirtualBox. A product from Oracle, that solved all of the issues I had. And the best thing, it’s Free! And even better, VirtualBox is out for several x86 operating systems such as Windows (tested and works awesome on Windows 10 even), MacOSX, Solaris and Linux! Download VirtualBox to your desired operating system here! 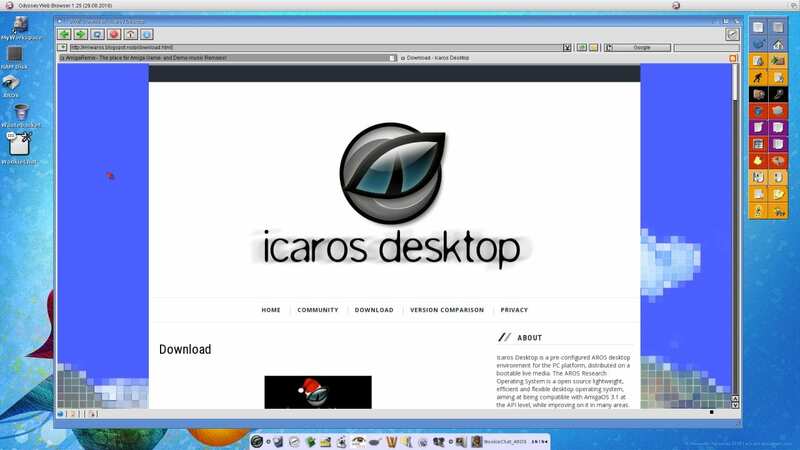 Locate the .ISO file inside the Icaros Desktop folder and Now You are ready to try out AROS! Now you are ready to use AROS! The Icaros Desktop opens in seconds and now you have to find out hotkeys. On Windows it is Right Ctrl and on MacOSX it is Left Cmd (left Apple key), which is the main key as standard. You use this with a hotkey like F, which toggles between window and fullscreen. I really suggest that you change the hotkeys. This can be done in window mode only, when AROS etc is open. Here you have Input in the menu. Goto Keyboard and then to Keyboard Settings. Here you can change them. It’s important to do so, as especially on a MacBook Pro Retina machine. You have no numeric pad and the cmd (Apple keys) is tied to MacOSX on it. In the Keyboard Settings in VirtualBOX, you can even set the base hotkey to be two keys. I have set it to Right Shift + Right Ctrl etc. So, now youre ready to use the black cat called AROS in the Amigaworld. AROS is open source, but that doesn’t mean its bad. 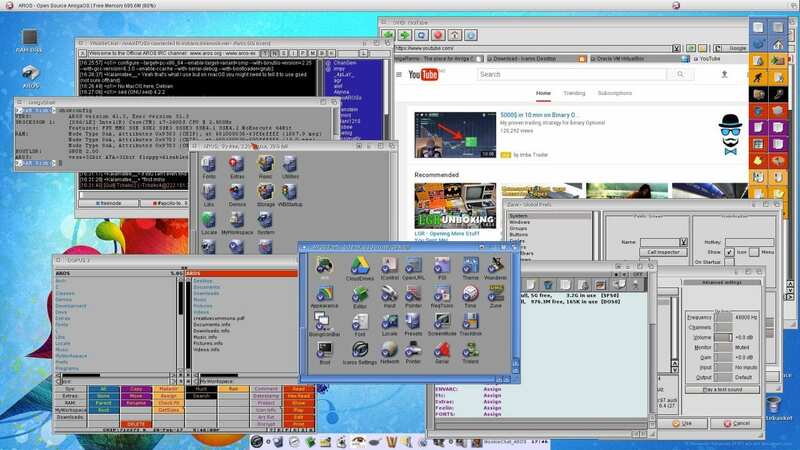 AROS delivers a lot and it helps both AmigaOS 4, MorphOS and AmigaOS 3.1 for Classic Amiga. It’s very useable, however with some limits. The AROS – Icaros Desktop package comes with Dopus Magellan as standard. Meaning, that AROS opens a very powerful desktop for you like Ambient does for MorphOS. Dopus Magellan is very known in the Classic Amiga world as it is a superb explorer beater. You never have better file browsing control for sure! OWB 1.25 is also bundled with this bundle, giving AROS a webkit browser that just works. Read your Gmail mails and watch YouTube clips without issues etc. In this guide I tried to inform about the basics on how to get AROS running on your system and my own experience is that VirtualBox did the job best. Also this VM is very easy to learn and use, compared to the other ones for a end-user like myself. We at Distrita and mostly at Amitopia website, will give you way more AROS articles from now on also. 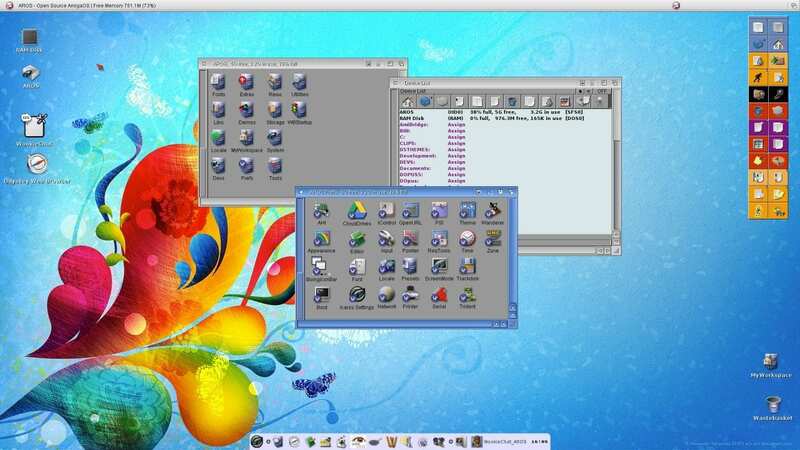 There are several Amiga apps that is developed for AROS, MorphOS, AmigaOS 4 and AmigaOS 3.1. The best example is Mapparium, which we at Distrita have written about it several times. Also the OWB browser is out for all nextgen AmigaOS options. Much more AROS content will now be found on Distrita and especially on Amitopia. We love independent platforms and we love independent communities!